In case you’re wondering what Wayne got for Christmas, well he got a couple of things. Two of them were Viking related: a feast knife and a Fenris cross (a norse wolf cross). He likes Vikings… what’s not to like about them? Anyway, the other thing I got him involved a bit of gathering separate (but related) items and a bit of DIY. 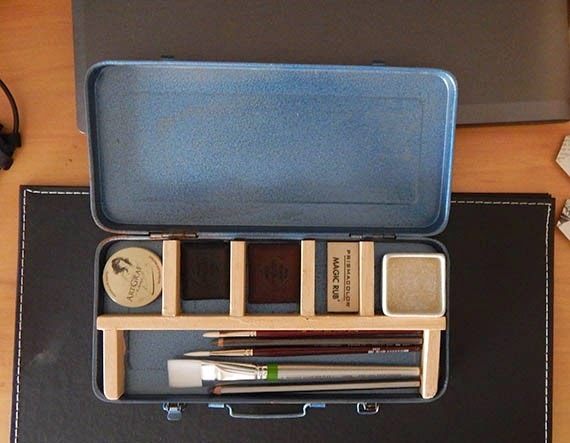 I’d seen a soluble graphite presentation box which I liked but when I went back to get it they were sold out. They only had a smaller version but it just wasn’t as good. 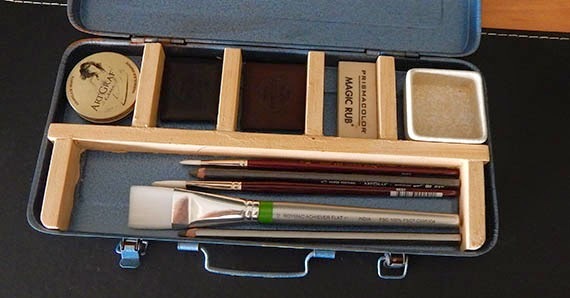 The box I’d seen originally had a soluble graphite block, a soluble pit charcoal block and a brush. I decided I’d buy the bits and make my own presentation/carry case for Wayne. I bought a small tub of soluble pit charcoal, one each of graphite in regular colour and one sepia, an eraser, 2 soluble graphite pencils in different leads and three brushes of different sizes. I located an old tin toolbox I had in the casita which was perfect. I had two of them, cause I collect things like that… I made one into a grooming room sign a few years ago (and sorry, I don’t have a photo, I put all my photos and a heap of other stuff on an external drive which decided to give up the ghost), and the other was the perfect size for Wayne’s gift. So, first things first: I gave it a good clean and a bit of a scrub with some steel wool. Its got some rust and some staining, but hey, that’s part of the beauty of it, right? I then painted his nickname on it. But the best thing is the inside! I had to make compartments for each of the bits so they wouldn’t just jumble around. They needed to have their own little spots. I had an offcut of pine which was just the right size. I cut the bits I needed, sanded any rough spots off, then used liquid nails to glue it together. I also used the glue to fix the pine frame to the tin. I added a small bowl I had for water, put in the pencils, brushes and graphite blocks. Voila. Presentation case and carry case all in one! I had planned to spray paint it, but I like the plain pine. I may have to give it a clear coat later to protect the timber from staining, but maybe not. 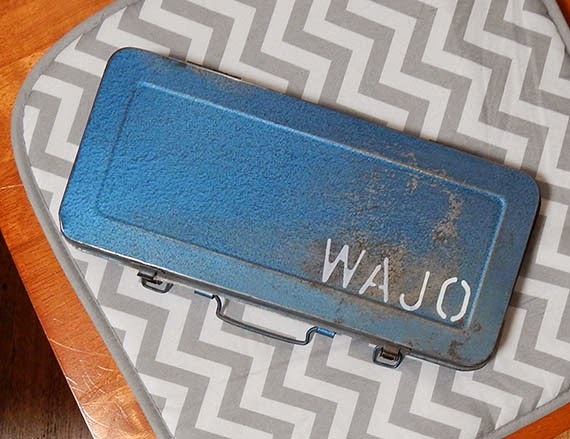 It might add to the patina… what do you think? I added a good quality drawing block and gave it to Wayne this morning. Now I await his masterpieces. At least I hope he tries it out. He used to do pen and ink work years ago and I’d like to see him art again.